This is the latest version with all new full 360 degree rotating turret! This is an early version of German Tiger I RC tank with highly detailed hand finished grey camo. The Taigen BB tanks are of the highest quality and are brand new to the market. What differentiates them from other tanks is the high level of detail and the strong metal components. Taigen tanks are available in different configurations but the ones we sell are the highest configuration with every possible option and upgrade included. Q: I'm considering the Taigen Tiger 1 early version with the full metal upgrade. I'm still a little confused as to what exactly is fitted with regards to the recoil mechanisms. Ive seen so many different versions on youtube. for example, where the entire tank body recoils, where the barrel of the gun and tank body recoil and ones where only the gun barrel recoils. I'm looking for the most realistic option preferably with the barrel and a small amount of chassis recoil. Which does this model have. Thanks in advance. This tank does not have a dedicated recoiling turret. Only the overall tank recoil. Q: Very interested in getting this one but need to know if this tank has the new Airsoft Recoiling Unit fitted? A: Hi, Thank you for your question. The tank it'self will recoil but the turret it'self will not. A: Hi, Thank you for your question. The tank it'self will recoil but the turret will not. Q: HI, how long is the operating time on one fully charged battery pack and is it supplied with remote control handset and battery charger, also can you tell me approx dimensions and weight. Thank you, best regards Lionel. Battery will last for 10-15 min. Q: hi does this tank have metal or plastic road wheels .? A: Hi, Thank you for your questions. The sprockets and tracks are metal on this model. Q: do you know what ratio the gearbox is in this model tiger? Q: Do all the latest fully metal taigen tanks come with the steel gearboxes ? Hi, yes the full metal upgrade ones all do. idle wheel, metal gearset (4 in 1 zinc gear with bearing), shock absorber, metal network, painted commander, metal pull rope, strength part for tank chassis, metal part for view, metal armor, metal turrent cover, shoulder wheel, metal tank chassis, metal front and rear hook, metal machine gun light, metal front forward light and hobby upper hull. Only the drive wheel, idle wheel and shoulder wheel are metal, the others are plastic. Hi, the range is around 25M. They are not fast as they are not built for speed. I don't have the exact figure but around 1-2 mph. Best thing would be to look on youtube for "taigen tank" and you will see some going. A: Hi, Yes, this model comes with the battery and charger! 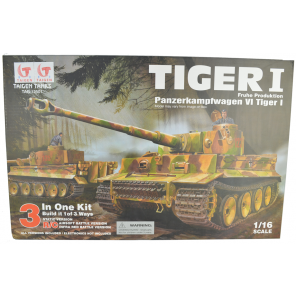 Q: What guarantee do the Taigen full metal 1/16th rc tanks come with is it a full 12 months? A: All of our items come with a 12 mouth manufacture guarantee.